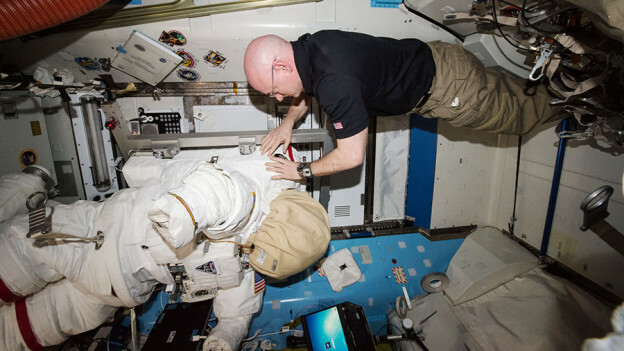 NASA astronaut Scott Kelly works on a spacesuit inside the Quest airlock. Two astronauts are wrapping up spacesuit maintenance today while a variety of human research takes place inside the International Space Station. Outside the station, the 57.7 foot long Canadarm2 robotic arm is being prepared for the upcoming release of a space freighter. Commander Scott Kelly and astronaut Time Peake from the European Space Agency are finalizing gear replacement work on a U.S. spacesuit today. The spacesuit will be inspected Monday before it is certified for return to service. On the life science front, Kelly joined cosmonaut Mikhail Kornienko and NASA astronaut Tim Kopra for eye and heart scans with an ultrasound. The scans are part of the ongoing Ocular Health study seeking to understand visual impairment some astronauts have experienced during their space missions. Kopra earlier attached sensors to himself for the Sprint study which seeks to reduce muscle and bone loss with new exercise techniques while living in space. Peake collected his own breath sample for the Marrow experiment that observes how microgravity affects bone marrow and blood cells. Ground controllers are maneuvering the Canadarm2 in position for the Feb. 19 grapple and release of the Orbital ATK Cygnus cargo craft. The Cygnus will be released for a fiery destruction high in the atmosphere over the Pacific Ocean after being attached to the Unity module for over two months. Happy valentine to you all from here, on the earth. Flowers in the ISS are also cute and so colorful. I appreciate you for sharing the photos! Nice posts, thanks for sharing & Godspeed! Happy Lovers Month of February 2016, NASA & ISS!